juli 2005 | 516 blz. Introduced into European Community law by the Court of Justice through its case law in the field of free movement of workers, the legal concept of indirect discrimination has evolved into one with far wider and greater relevance to many other areas of EC law as well. 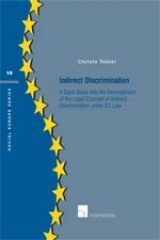 This book analyses the concept of indirect discrimination in a broad and comparative context, which encompasses both economic and social law.